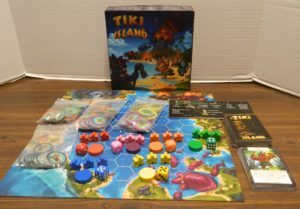 We would like to thank Great Wight Games for the preview copy of Tiki Island used for this preview. Other than receiving the preview copy we at Geeky Hobbies received no other compensation. Receiving the preview copy had no impact on the content of this preview.This preview uses a pre-release copy of the game. While the copy feels close to the final version of the game, rules and components may change before the final version of the game. Place the gameboard in the middle of the table. Each player chooses a color and takes the three islanders and the tiki (round disc) of that color. When choosing colors players should choose colors that are evenly spread around the gameboard. Each player places their islanders on the starting spaces that match the color they chose. Players can choose which of the four starting spaces they want to put islanders on but only one islander can be put on each space. Players then place their tiki on any of their starting spaces even if there is an islander on that space. Players take the island tokens matching their color and a player reference card. If there are four players place a neutral island token (gray) on the “4” space in the center of the gameboard. If there are five or six players place a neutral island token on the “5+” spaces. Shuffle the rune deck of cards and deal one card to each player. The first player is chosen in whichever way the players choose. The objective of the game is to get your three islanders to the island directly across from your starting island (goal island). Each player’s goal island is indicated by the color of the flag on your starting island. To start each player’s turn they can choose to play a permanent rune card from their hand. The player then rolls their die. The die roll determines the advanced action that a player can take on their turn. If a player rolls a six they can choose one of the other advanced actions or they can remove a played permanent rune card from the table and take a basic action. The player can choose to perform the advanced action they rolled or they may take one of the basic actions instead. The current player has rolled a three. They can choose the advanced action of +2 Move +1 Build or they can choose one of the basic actions. In addition to taking an advanced or a basic action, a player can play a card(s) to perform additional actions. When a player has performed all of their actions, play passes to next player clockwise. The basic actions in Tiki Island can be broken down into four different types. Islanders and tikis can only move to adjacent friendly islands or neutral islands. A player cannot move a piece onto another player’s island, an ocean hex, or the starting island of another player that isn’t their goal island. 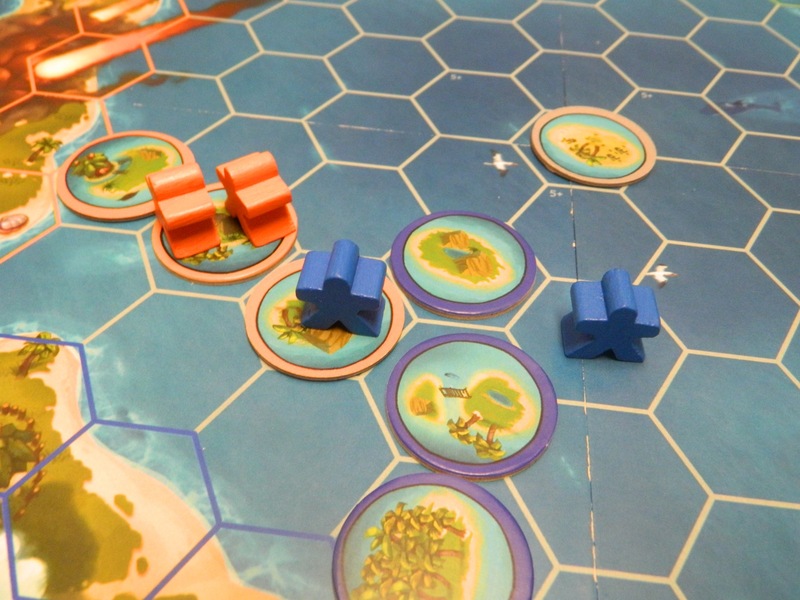 Two islanders may never occupy the same island hex at the same time even during a player’s turn. Here is a picture of three illegal moves in the game Tiki Island. The two orange islanders are sharing an island. 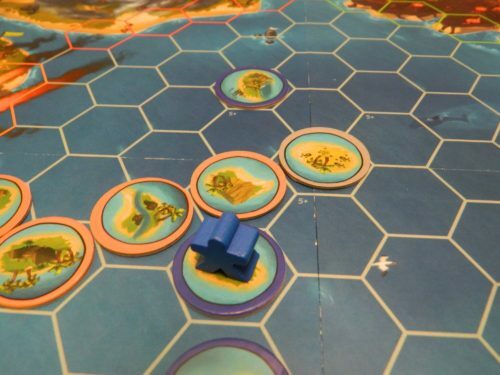 One of the blue islanders is on another colored island. The other blue islander is on an open ocean space. Build: When a player has a build action they can add islands to the gameboard. A player can add as many islands to the board as the number of build actions they have. A player can add an island to any unoccupied space on the gameboard that is within three spaces of their tiki. The blue player can build an island on any space within three spaces of the location of their tiki. The blue player can build an island on any space between their token and the blue island tokens or on any of the spaces with a blue island token. Draw A Rune: The player takes the top card from the rune deck and adds it to their hand. There is no limit on how many cards you can have in your hand. Soar: If a player acquires soar that player can ignore all of the rules regarding movement for the rest of their turn. The only rule regarding movement is that at the end of your turn all of your pieces must be in compliance with the movement rules (no two islanders on a island, all islanders and tokens on valid spaces). If the blue player has soar and three movement points they can reach the blue island above them. They first can move on another player’s island. They then can move over an open ocean space before reaching one of their own islands. While you don’t have to get your tiki to your goal island to win, your tiki still serves an important purpose. Your tiki determines where you can build new islands. Rune cards that apply to a certain range apply from the location of your tiki. Finally your tiki provides tiki aura. The tiki protects the island that it is on as well as islanders on that island from any rune cards that have the word “Protected” on it. This blue islander is on the same space as their tiki. This islander will have tiki aura so any cards with the word protected on it cannot be played against this islander. +1 Movement: A card can be discarded to add one movement to a player’s turn. +1 Build (limit 1): A card can be discarded to add one build to a player’s turn. Soar: Two cards can be discarded to give the player soar for the current turn. A player can play or discard a rune card(s) at any time during their turn. If the card has the word “unhindered” it can be played or discarded on another player’s turn. You can’t play or discard a rune card on the turn you drew it. A player must carry out everything listed on a card as long as it is possible. If a card has two sets of effects the player has to roll the die to determine which set of effects occur. Here is a picture of the three different types of rune cards. Permanent cards stay in front of a player until they are removed. The protected cards can’t be played against players with tiki aura. The unhindered cards can be played on other player’s turns. 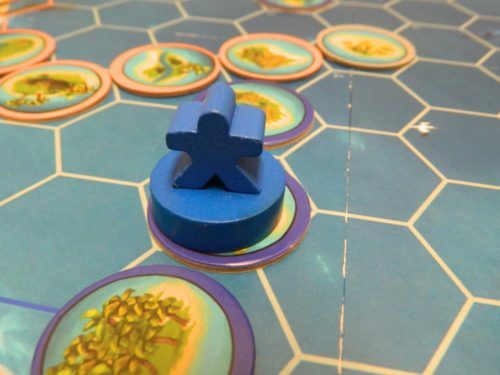 When a player gets one of their islanders to their goal island, the islander is removed from the board since it has safely reached its’ destination. This islander is safe from the effects of any card played. The first player to get all three of their islanders to their goal island wins the game. 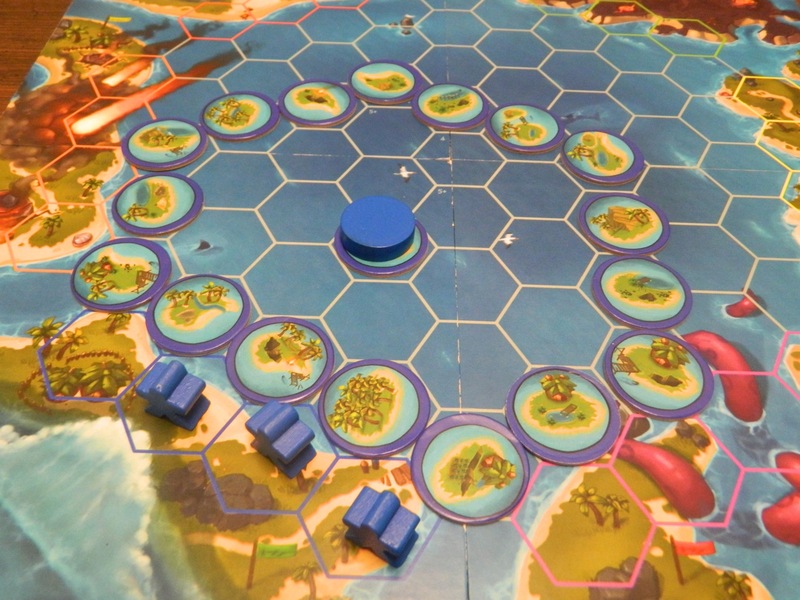 The blue player has won the game because they got all three of their islanders to their goal island. I have to say that it is kind of hard to classify what type of game Tiki Island exactly is. The game shares mechanics from a lot of different genres and yet it really doesn’t fit into any of them completely. The game has roll and move elements as you roll a dice and move around your villagers. The game also has tile laying, cards with special abilities with some cards giving your permanent advantages, choices for which action to take every turn, along with other mechanics. It might not really fit well into a specific genre but Tiki Island is a great blend of different mechanics that makes for a compelling game. While I enjoy games of all levels of strategy from light to heavy, I would have to say that my favorite games are probably in the light to moderate strategy range. This is exactly where Tiki Island would fall on the strategy spectrum. 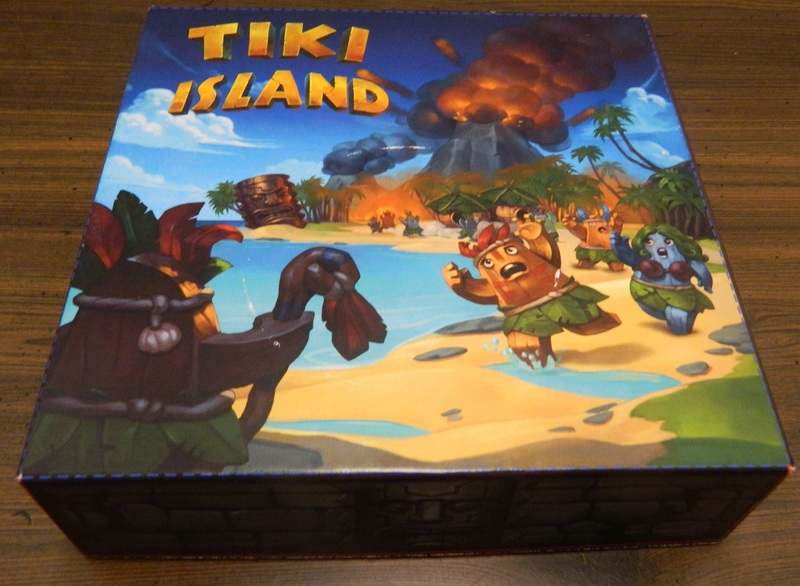 Tiki Island is the type of game that is easy to learn but still contains quite a bit of strategy. Most people could probably learn the basics of the game within five to ten minutes. The only somewhat difficult part of the game is sometimes figuring out exactly what some of the cards do. In addition to games that are light to moderate on the strategy spectrum, I also love games that give you options. A sign of a good game is a game that gives you options for what you can do on any given turn. I like games that give you options since it allows you to craft your own strategies and it feels like your choices matter in the game. While there is only four basic actions in Tiki Island, you can use them to create different strategies. When you add in the card’s abilities, you can approach Tiki Island in quite a few different ways. In general I am not a huge fan of games that rely a lot on luck. While I don’t mind a little luck in games (games would be pretty dull otherwise), I generally like when your actions in the game determine your fate in the game. I like to see luck stay at a low to moderate level. With Tiki Island utilizing a die to determine a player’s action on a given turn you would think that Tiki Island would rely heavily on luck. That is not the case though since Tiki Island does a good job letting luck play a big enough role to keep the game interesting but not having a huge role in the outcome of the game. Here is where I have to give the game a lot of credit for the idea of advanced and basic actions. These two types of actions give Tiki Island the perfect level of luck (light-moderate). On every turn you obviously want to roll a six since it lets you take any advanced action that you want. Otherwise you are going to want to roll the number that gives you the most of the action that you want to perform on that given turn. Now in a lot games you would roll the die and would regularly get stuck rolling a number that you didn’t want and thus can either do nothing or be forced to do something that you didn’t really want to do. This is where the idea of the basic actions comes into play. While the basic actions are never as good as the advanced actions, they give you a lot of flexibility. For example if you really wanted to build on a turn but didn’t roll an action that allowed you to build you could just choose the basic action of +1 build so you are able to build one island on your turn. While it isn’t as good as using one of the advanced build actions with build, you can still build an island if it was key to your strategy. What I really like about the basic actions is that they are worse than the advanced actions but they are close enough that a player that chooses a basic action doesn’t fall too far behind the other players. I think controlling the board is very important to winning the game. The more spaces on the board that you control, the more options you have for movement and the more you restrict other player’s movement. It is unlikely that a player will create a complete path towards their goal island (especially in games with more players) but the more islands you control the more options you have when you use the soar option. I think the island building mechanic is interesting because different players will try to build their paths in different ways and it is always interesting when players get in each other’s way. I wish there were more opportunities to mess with other player’s islands though. The game has some cards that allow you to mess with other player’s islands but I wish there were more ways to change up the islands once they have been placed. So far I have played the game with three other players. As a four player game Tiki Island works quite well. There is a lot of jostling for position and congestion in the middle but I think that is a good thing because it makes you have to think more creatively and use all of the different actions available to you. Soar in particular becomes really important. I really like the soar ability. It is not that common to get it but it is quite powerful. Unless you are lucky enough to build a path straight from your start to your finish you are going to have to use soar to jump over other player’s islands. Soar adds quite a bit of strategy to the game since you could try a strategy where you don’t even try to build a complete path to the other side and instead rely on using soar to jump between islands. While the game works really well as a four player game and I would assume well as a three and five player game, I am a little curious on how the game would play as a two or six player game. My concern with the two player game is that there won’t be enough competition for spaces which means that players won’t have that much trouble building a path across the board. One of the best parts of the game is when everyone is congested in the middle of the board and the players need to figure out how to get out of it. I think the two player game will be more of a race to see who can build a path to the other side faster. On the other hand I am worried about the six player game because I think it will lead to complete chaos in the middle of the board as everyone tries to lay claim to the spaces. It is somewhat hard to move around the middle of the board in the four player game so I can’t imagine how hard it will be in the six player game. I am guessing that soar will be critical in the six player game. The one area of Tiki Island that I am the most conflicted about are the rune cards. I love a lot of things about the cards. A lot of the cards have some really creative effects like one card that I used which allowed a player to throw an island to another area on the board. I also really like that a lot of the cards have a positive and negative effect so players need to be cautious about what cards they decide to play. The thing I like most about the cards though is the fact that if you don’t like one of your cards you can discard it and get a different benefit from the card. I love this idea because you can get something out of a card that you otherwise wouldn’t have used. Also if you are in a situation where you need additional movement, build, or even soar you can sacrifice some cards to get an action when you need it. This brings me to the one thing that I didn’t really like about the cards. The cards seem to have some balancing issues. Some cards are really good (most of the permanent cards) while other cards have very specific purposes. Some of these cards just don’t feel like they are worth playing for their effect except in very specific situations. These cards usually become discard fodder which you discard to get a different action. Since you can discard cards for a benefit I can see all of the cards not being exactly equal but I wish the cards were still a little more balanced. I am not sure what changes there will be to the contents for the final version of the game but I have to say that even in the preview version of the game the contents are already quite nice. I really like the game’s artwork. The player reference cards and rune cards are well designed making it easy to find the information you need. 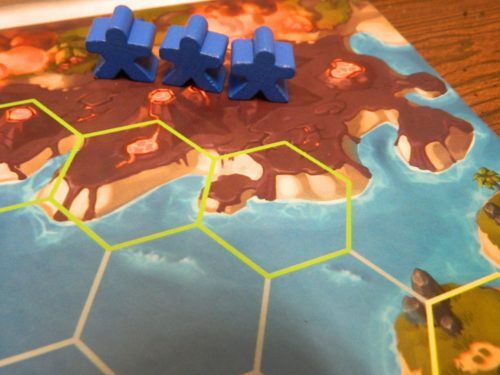 Honestly the only real complaint I have with the components is that the island tokens are circular while the spaces on the gameboard are hexagons. Since the tokens are a different shape than the spaces, the tokens occasionally slide between spaces and you have to remember which spaces the island tokens were on. Hopefully the final version of the game includes hexagon tokens for the islands that are the same size as the spaces on the gameboard. I have to say that I really enjoyed my time with Tiki Island. While the game is pretty easy to play, the game gives players quite a few options. Tiki Island has quite a bit of strategy despite being so easy to play. It is interesting to see how all of the players try to get to the other side of the gameboard especially when everyone runs into one another in the center of the board. While your actions for a given turn rely on the roll of the die, you can always choose to take a basic option. Don’t like one of your cards, trade it in for a different action. That is what I truly love about Tiki Island. Even if you don’t roll what you want or get the cards you want, you can always adapt and choose a different action. My only two real complaints with Tiki Island is that I don’t think all of the cards are evenly balanced and I don’t know how well the game will play with two or six players. If Tiki Island sounds interesting to you I would highly recommend looking into the game. I really enjoyed my time with the game. Tiki Island’s Kickstarter campaign runs until September 29th, 2016. If you pledge at least $35 you will receive a copy of the game if it is funded. If you are interested in Tiki Island you can check out the Kickstarter page here. Easy to play and yet has quite a bit of strategy. Gives players plenty of options in what they can do on a turn. Some cards are really good while others have very specific uses. The game is best for 3-5 players.